My mother and step-father popped over for a short visit last weekend. 2 days in Prague and 2½ days with us. The Partnerin thinks its crazy that Americans can travel so far for only a few days ... I make her crazy when we go to the US by dragging her to at least three places in two weeks, which will be the case in two days. Anyway, the nice thing about Mom visiting is getting to see all the sights that have faded into the background of my life over here. 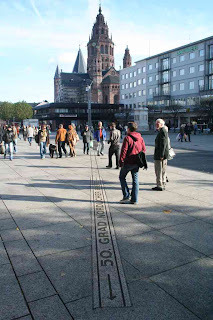 I knew that Schloss Johannisberg in the Rheingau had a 50th parallel marker, but I didn't realize the same line of latitude was so clearly mapped out in Mainz and that the Dom lies directly on it. Clever, those Medieval cathedral builders. 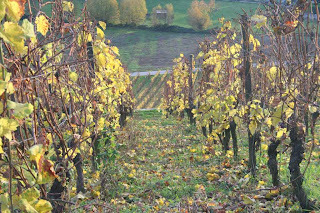 The nice thing about the Rheingau is it gives you dozens of pathways with no shortage of views. 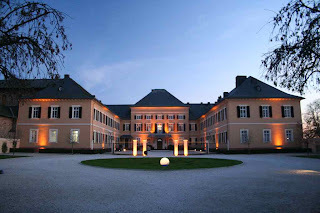 Johannisberg is emblemmatic of a Schloss in what I will call the classic French style (I'm not an architect, so don't hate me if there is a formal name for this and I don't know it). 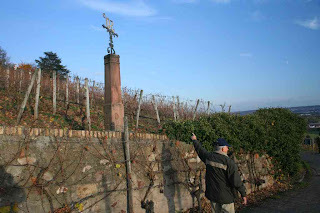 The estate is part of the Mumm family. 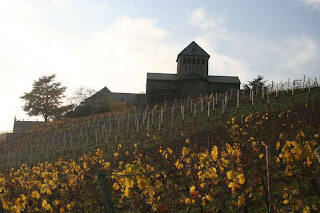 As far as Rheingau tastings and tours go, it isn't perhaps as friendly as some of the other Schloss's for frequent visitors to the region, but it is really a winner for the casual tourist or visitor looking for scenery. If the Partnerin and I ever marry, it may very well be here. We've discussed Denmark for the easier paperwork, but I think I owe her a palace for putting up with me all these years, and this one comes with a nice old chapel. Oh, it's so nice there! I love it! I've been to Mass in that chapel, too! We chose Denmark. Much easier. At least, it was 21 years ago. The new bride of less than a day was also able to get a Green Card in under 2 hours at the Consulate in Frankfurt the next day. I wonder if that's still possible today?